Dr. Natasha Campbell-McBride holds a degree in Medicine and Postgraduate degrees in both Neurology and Human Nutrition. In her clinic in Cambridge she specializes in nutrition for children and adults with behavioral and learning disabilities, and adults with digestive and immune system disorders. Dr. Campbell-McBride set up The Cambridge Nutrition Clinic in 1998. As a parent of a child diagnosed with learning disabilities, she was acutely aware of the difficulties facing other parents like her, and she has devoted much of her time to helping these families. She realized that nutrition played a critical role in helping children and adults to overcome their disabilities, and has pioneered the use of probiotics in this field. She believes that the link between learning disabilities, the food and drink that we take, and the condition of our digestive system is absolute, and the results of her work have supported her position on this subject. In her clinic, parents discuss all aspects of their child’s condition, confident in the knowledge that they are not only talking to a professional but to a parent who has lived their experience. Her deep understanding of the challenges they face puts her advice in a class of its own. Gut and Psychology Syndrome (GAP Syndrome or GAPS) is a condition, which establishes a connection between the functions of the digestive system and the brain. 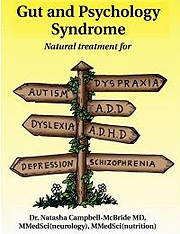 This term was created by Dr Natasha Campbell-McBride, MD, MMedSci (neurology), MMedSci (human nutrition) in 2004 after working with hundreds of children and adults with neurological and psychiatric conditions, such as autistic spectrum disorders, attention deficit hyperactivity disorder (ADHD/ADD), schizophrenia, dyslexia, dyspraxia, depression, obsessive –compulsive disorder, bi-polar disorder and other neuro-psychological and psychiatric problems. The purpose of the treatment is to detoxify the person, to lift the toxic fog off the brain to allow it to develop and function properly. In order to achieve that we need to clean up and heal the digestive tract, so it stops being the major source of toxicity in the body and becomes the source of nourishment, as it is supposed to be. As more than 90% of everything toxic floating in our blood (and getting into the brain) comes from the gut, healing it will drop the level of toxicity in the body dramatically. This target is achieved by means of The Nutritional Programme. This programme has evolved through the personal experience of Dr. Campbell-McBride’s family and clinical experience with thousands of GAPS children and adults around the world. The GAPS diet was derived from the Specific Carbohydrate Diet (SCD) created by Dr. Sidney Valentine Haas to naturally treat chronic inflammatory conditions in the digestive tract as a result of a damaged gut lining. SCD gained great popularity after a mother, Elaine Gottschall, healed her own child of Ulcerative Colitis and became an advocate for SCD. Elaine Gottschall is also the author of the popular book, Breaking the Vicious Cycle:Intestinal Health Through Diet. Through years of research and clinical experience, Dr. Natasha Campbell-McBride adjusted her protocol to fit the individual healthcare needs of her patients suffering from a variety of intestinal and neurological conditions as a result of an imbalanced bacterial ecosystem within the GI tract. The GAPS Diet focuses on removing foods that are difficult to digest and damaging to gut flora and replacing them with nutrient-dense foods to give the intestinal lining a chance to heal and seal. The GAPS Protocol is broken into three parts specifically designed to heal and seal the gut lining, rebalance the immune system, and restore the optimal bacterial ecosystem within the gastrointestinal tract. The Nutritional protocol restricts all grains, commercial dairy, starchy vegetables and all processed/refined carbohydrates while focusing on easily digestible and nutrient dense foods. The Supplementation protocol needs to be tailored to fit the individual healthcare needs of the patient but generally includes a commercial probiotic to provide beneficial bacteria along the GI tract, essential fatty acids, cod liver oil, and targeted digestive support. The Detoxification Protocol enforces natural ways to cleanse the liver and colon through juicing, GAPS Milkshakes, and enemas while reducing the general toxic load by restricting man-made chemicals and heavy metals. The GAPS diet is divided into two parts: The Introduction Diet and the Full GAPS Diet. The Introduction Diet can be very overwhelming to patients, parents, and children who are used to a traditional Western Diet. Starting with the Full GAPS Diet and implementing the protocol in stages may be the best option for some in order to ease into the dietary changes. Dr. Campbell-McBride recommends for patients with severe digestive issues and severe food sensitivities to start with the Introduction Diet. For those suffering from constipation and mild symptoms, starting with the Full GAPS Diet may be a better option. Once a patient has moved through the Full GAPS Diet, there is an additional stage outlined in the Gut and Psychology Syndrome book called Coming Off the GAPS Diet. The Introduction Diet is divided into six stages. It generally takes patients 3-6 weeks to complete all the stages, however this is very individual and some patients may take longer. The Introduction Diet is designed for patients with severe digestive issues including chronic diarrhea, IBS, Crohn’s, gastritis, and Ulcerative Colitis as well as patients with severe neurological conditions including autism, schizophrenia, depression, and bipolar. Some patients may exhibit neurological conditions with no clear digestive symptoms and may be able to move through the Introduction Diet more quickly, listening to their body and observing for negative reactions. Once a patient has moved through the six stages of the Introduction Diet, they are ready to move onto the Full GAPS Diet. For patients who skipped the Introduction Diet, Dr. Campbell-McBride recommends following the Dairy Introduction Structure on page 124 when introducing dairy products. It is important to remember the majority of the patient’s diet should consist of meats, fish, eggs, fermented foods, and vegetables. Over indulging in baked goods made from nut flours and fruit can be detrimental to the healing process and should only be consumed in moderation. For patients suffering from yeast overgrowth, temporarily eliminating fruit, honey, and nuts may be beneficial. All patients handle nutritional/supplemental protocols differently and may need additional targeted support other than the essentials recommended by Dr. Campbell-McBride. This is a matter for a qualified practitioner to decide. Only choose supplements with the least amount of added ingredients that may aggravate the gut condition. An effective therapeutic strength Probiotic , Essential Fatty Acids , Vitamin A , Digestive enzymes , Vitamin and mineral supplements. Effective Therapeutic Strength Probiotic – Probiotics are most commonly used in the treatment of gastro-intestinal disorders including: viral infections of the digestive tract , necrotising enterocolitis in infants , intractable pediatric diarrhea , pseudomembranous colitis , traveler’s diarrhea , Clostridium Difficile enterocolitis , enterocolitis , Helicobacter infection , enteropathogenic E. coli infection inflammatory bowel disorders: Crohn’s disease, ulcerative colitis and chronic pouchitis irritable bowel syndrome , lactose intolerance , prevention of colonic cancer. Arthritis , diabetes , burns of various degree , perioperative care and intensive care in surgical patients and patients with massive blood loss , clinical infections , autoimmune disorders. While many conditions may benefit from the use of probiotics, the above list has had scientific papers published on the benefit of probiotics with the specific condition. General Guidelines for choosing a good probiotic: A good probiotic should have as many different species of beneficial bacteria as possible. A mixture of strains from different groups of probiotic bacteria is more beneficial than just one group. A good probiotic should have a concentrated amount of bacteria: at least 8 billion of bacterial cells per gram. The manufacturer of the probiotic should test every batch for strength and bacterial composition and should be prepared to publish the results. Bio-kult is the recommended probiotic by Dr. Campbell-McBride. GAPS children and adults should have a group of essential oils supplemented: A good seed/nut oil blend in the ratio of 2:1 of omega-3:omega-6 fatty acids. Make sure that the oil is high quality, in dark glass and refrigerated after opening. Cod liver oil to supply EPA, DHA, vitamin A and vitamin D. Fish oil with higher ratio of EPA to DHA, as more EPA seems to be beneficial for GAPS patients. There are no toxic levels for these oils. As listed previously, vitamin A is recommended in the form of Cod Liver Oil (CLO). Vitamin A deficiency can lead to a variety of digestive issues. Leaky gut and malabsorption are the typical results of vitamin A deficiency. Unfortunately, GAPS children and adults usually cannot absorb or use many forms of vitamin A, commonly found in supplements. A natural form of vitamin A found in CLO appears to be the best form for these patients. These are the enzymes people generally think of when hearing the words “digestive enzymes”. These enzymes are usually combinations of proteases, peptidases, lipases, amylase, lactase and cellulase. In a healthy digestive tract, these enzymes are naturally produced by the pancreas. If normal stomach acidity can be returned, these enzymes should work efficiently. Dr. Campbell-McBride recommends supplementation with stomach acid. If you feel benefit from the use of these supplements, make sure they do not contain fillers or binders which may interfere with the healing process in the gut. Dr. Campbell-McBride does not generally recommend any vitamin or mineral supplementation at the beginning of the program for patients with severe digestive issues. Some patients may require targeted supplementation including liver support and detoxification support but this is a matter for a qualified practitioner to decide. If you are going to use supplements: Choose supplements without any ingredients which may aggravate the gut condition. Choose supplements with a high absorption rate. Keep supplements to a minimum. Detoxing can cause damage in the body, on top of damage from accumulated toxins. Supporting the body’s natural cleansing process is necessary to repair damaged tissues. Dr. Campbell-McBride recommends light methods of detoxification, as intense detox programs can actually cause more harm than good by overwhelming the organs responsible for neutralizing and eliminating toxins. Another important part of the treatment is reduction of the general toxic load. Keep your house chemical free and avoid bringing anything into the home which will let off chemicals such as new carpet, furniture, and paints. Also remember that your skin absorbs just about everything it comes in contact with so be very cautious with the products you put on your skin. Household plants are great at reducing the toxic air in our houses. They consume the toxic gases and replace them with oxygen and other beneficial substances.